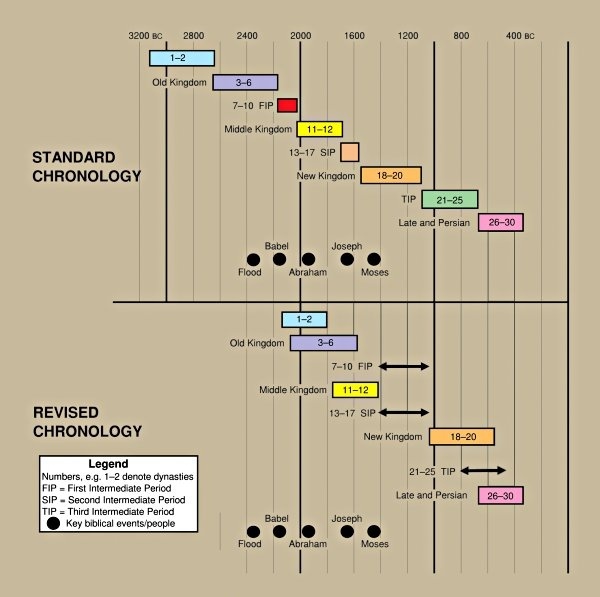 According to the commonly accepted timeline for Egyptian chronology, much of the Old Testament was off by several hundred years and seems quite historically impossible. Ditto for the historical records of the Hittites. And the Assyrians. And pretty much everyone else in the region whose records are tied to proper dating of the Egyptian dynasties. I’m no Egyptianolologist or anything, and granted, most of my Ph.D’s are honorary and in fields somewhat distant, but heck, why not just change the damn dynasties around and make it all fit? It’s not like it’s all written in stone or linked to the stars, right? I’m thinking there’s just a little guess-work involved here. Of course, what I’m about to do here doesn’t count for anything more than another hypothetical, and I’m not going to pretend to be the least bit objective about it. However, if the archaeologists would just do their jobs a little better, I’m thinking they could probably sort this out accordingly. How hard can it be, right? The way they’ve got it now, they’ve got Moses hittin’ the trail somewhere in the 18th or 19th dynasty or something, with nothing happening because of it. Ten plagues, loss of an army, economic and social collapse — obviously not happening there. The kinds of collapse and ruin we’re looking for happens at the end of the 6th and 12th dynasties. So, duh, that’s probably when it all went down. And it also helps to line up the numbers so that Joseph drops in on Djoser at the start of the Old Kingdom, since Joseph, whom the Bible says brought peace and wholeness between Israel and Egypt, becomes Djoser’s vizier. At peace/wholeness (bashalom / imhotep). The chart on the left is one possible chronology. There are numerous ways to compile the dynasties to fit what we know about them. 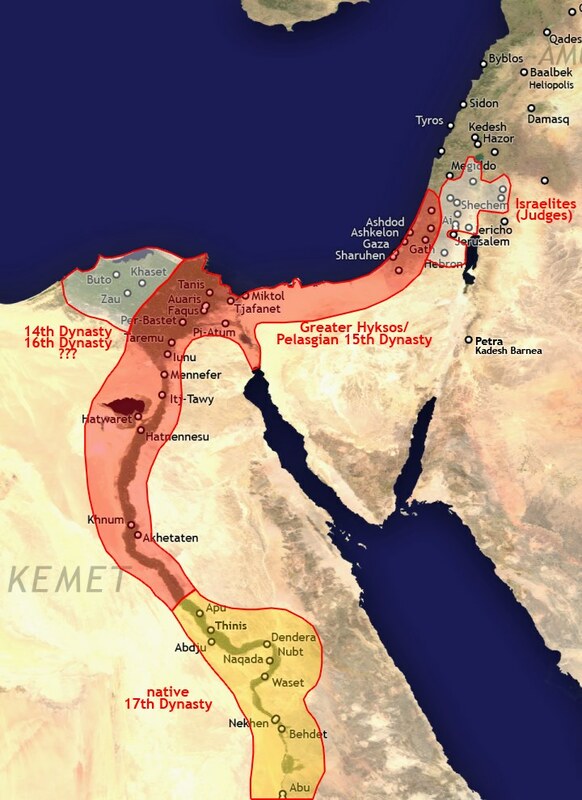 The standard chronology lists them successively, even though Egypt was divided into upper and lower geographical zones, and dynasties would have ruled concurrently from these two areas. I think the best discussion I’ve been able to find on the subject comes from Ken Johnson’s Ancient Post-Flood History, which completely contradicts the guesswork of mainstream Egyptologists. A summation of his argument follows hereafter. If we compare several sources concerning the Dynasties of Egypt’s Old Kingdom (such as the Temple of Seti in Abydos, the Turin Papyri, Egyptian historian Manetho, Jewish sources like the Book of Genesis, the Book of Jasher, the Seder Olam, the Talmud, the Mishna, the Codex Judaica, and others) — we can map Dynasties out with considerable detail. Menes (Mizriam) is credited with founding Memphis, the capital of the First Dynasty, twelve miles south of modern Cairo. Memphis served as the capital of the First, Fourth, and Sixth dynasties. Elephantine, an island in the Nile River on the border of Egypt and Nubia, was the capital of the Second, Third, and Fifth dynasties. There were always two dynasties ruling at the same time. The First, Fourth, and Sixth dynasties were consecutive and ruled from Memphis. The Second, Third, and Fifth dynasties were consecutive and ruled from Elephantine. Genesis 10:6 details Mizraim, the son of Cham, founded the nation of Egypt. This would make him the first king of the First Dynasty of Egypt’s Old Kingdom, called Menes in the Egyptian records. Both Genesis 10:13 and Jasher 7:11 record Mizraim’s son, Anom, succeeded the throne. Jasher 14:2 records that Anom’s son, Oswiris, became the third king of the First Dynasty. In time, Anom would be deified and worshiped as the Egyptian god Amon-Ra, and Oswiris, as the god Osiris. An Assyrian migrated to Egypt and began the Second Dynasty. The Hebrews called his name Rikayn, the Egyptians called him Boethos. There was a great famine during the reign of Uenephes (c. 1925 BCE). This was likely the famine that caused Abraham (who did exist) to migrate to Egypt for three years. Genesis 12 records Abraham moved to Canaan when he was seventy-five years old. Shortly after the move, a severe famine hit Canaan. Abraham went down to Egypt until the famine was over. Looking at Jasher 13.22, 13.5, and 16.22, we have a clear record of Abraham settling in Canaan and the three-year famine occurring during the years around 1900 BCE. This corresponds to an event in the reign of Boethos, when a great chasm opened up at Bubastis and many perished, possibly the cause of the great famine. In the Third Dynasty, Djoser was the Pharaoh of Joseph’s time. According to Manetho, the seven-year famine occurred in the eighteenth year of the reign of Djoser Teti. Joseph interpreted Pharaoh’s dream of seven years of plenty and seven years of famine, and became Viceroy of Egypt. Genesis 41:45 says Pharaoh renamed Joseph “Zaphnath-Paaneah.” Manetho records a seven-year famine occurred in the eighteenth year of the reign of Djoser. If this seven-year famine is the same as the one Joseph predicted, then the eighteenth year of Djoser was c. 1690 BCE. The Viceroy of Djoser, Imhotep, designed the step pyramid at Sakkara. On a rock monument at Sehel, an inscription describes how Pharaoh consulted the wise Imhotep about a seven-year famine. In another inscription near the step pyramid, the builder is referred to as Zanakht – similar to Joseph’s Egyptian name Zaphnath-Paaneah as given in Genesis. Both Imhotep and Joseph lived to be one hundred and ten years old. When Imhotep was one hundred years old, his wisdom was tested by new court officials by asking him to create an oasis in the desert, so he engineered a feeder canal from the Nile to his man-made lake. Today in the region of El-Fayoum, southwest of Cairo, remains the man-made fresh water lake called Birqet Qarun, fed by a canal stretching from the Nile to the Basin. The canal is known as Bahr Yousef or the Sea of Joseph. Since this was built during the last ten years of Joseph’s life, that could date Birqet Qarun’s construction between 1625-1615 BCE. In the Sixth Dynasty, Pepy II would be the Pharaoh that persecuted the Children of Israel. The empire of his son, Neferkare the younger, was destroyed by Moses. The Sixth Dynasty tried to hold on for almost two years after the Exodus. The Fifth Dynasty (Upper Kingdom) remained intact for almost twenty-four years after the Exodus, as a vassel state, before its final fall. The Pharaoh of the Exodus, Adikam, ruled four years, including three years co-ruling with his sick father. Adikam was a dwarf; the Hebrews called him Adikam Ahuz (Ahuz meaning “short” in Hebrew). Adikam’s father, Pharaoh Melol, had leprosy during the last ten years of his life but still ruled a total of ninety-four years. Melol reigned from c. 1572 to 1478 BCE. Joseph reigned from c. 1697 to 1616 BCE. So Melol would be the “Pharaoh who knew not Joseph” who started the heavy persecution of the Israelites. Egyptian records in the Temple of Abydos, the Turin papyrus, and the Egyptian historian Manetho, show that Pharaoh Neferkare Pepi II (also called Phiops II and NetjerKhau) was the longest living Pharaoh in the Old Kingdom, becoming Pharaoh at the age of six and lived to be one hundred years old. His son, Neferkare the Younger, (also called Menthesuphis and Merenre Antiemsaf II) ruled only one year after his father’s death. This exactly matches the description in Jasher. 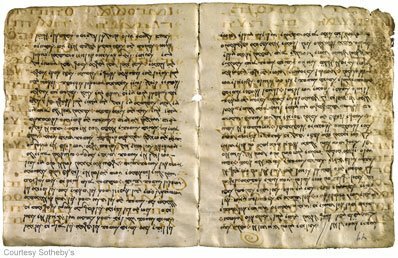 The Leiden Papyrus, also called the Ippuwer Papyrus or “The admonitions of an Egyptian sage,” is an account of the plagues that destroyed the Sixth Dynasty. 2:5-6 Plague is everywhere. Blood is everywhere. 7:4 He who poured water on the ground; he has captured the stong man in his misery. 2:10 The river is blood. Men shrink from tasting… and thirst for water. 2:10 Gates, columns and walls are consumed by fire. 6:1-4 No fruit or herbs are found… Grain has perished on every side. 9:2-3 The land is not light… 9:8-10 Destruction… the land is in darkness. 2:13 Men are few. He who places his brother in the ground is everywhere. 4:3 The offspring of nobility are laid out on the high ground. 3:3 Gold, bluestone, silver, malichate, carnelian, bronze… are fastened to the necks of female slaves. 7:1 Behold the fire mounted up on high. Its burning goes forth before the enemies of the land. Jasher 76 and Josephus Ant. 2.10 describe Moses leading an army against the Ethiopians at Elephantine under King Kikianus. The same year that Moses fled Memphis, King Kikianus defeated the uprising of Aram and the Kedemites. Upon his return, Kikia nus discovered that the city of Elephantine had been taken over by Balaam and his sons. Kikianus besieged the city for nine years, then died of a disease in 1530 BCE. 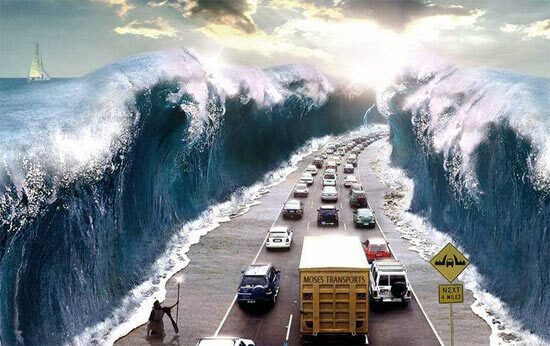 Moses delivered the city and ruled it for thirty-nine years. The city was then turned over to Menacrus, the son of King Kikianus in 1491 BCE. Moses was eighteen when he left Egypt. He lived ten years in Kikianus’ camp, spent thirty-nine years as the king of Cush (ruling from Elephantine ), then lived thirteen years in Midian, until he led the Exodus at the age of eighty. When Moses killed the Egyptian and fled at age eighteen and became a part of Kikianus’ camp, Cush was controlled by Egypt from Memphis. When Moses became strong enough, the southern Fifth Dynasty kingdom seceded from Egypt. All told, Moses spent eighteen years with Egypt and ten in their army, thirty-nine years as their king, and thirteen years in the wilderness. That leads up to his eightieth year, when he led the Exodus out of Egypt, bringing about the end of the Old Kingdom. And just like that, you get a square peg into a round hole. Such information is hardly new and has no more merit in my regard than it did when I compiled a detailed research paper on the matter 23 years ago. 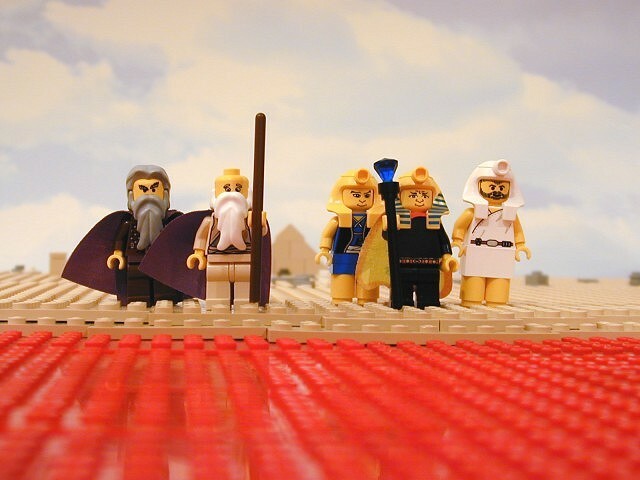 John Zande summed up the basic challenge in a couple of well-written posts over on his blog: if Moses wasn’t the historical person described in Scripture, then Jesus wasn’t the Messianic incarnation of God, and the Bible has no credibility. So, for the Christian, a line should be drawn. The patriarchs must be historical persons who lived during the times described. The genealogies leave no question as to the intended accuracy of the claims. The prevailing wisdom holds that those “in the know” in the fields of Biblical archaeology and textual criticism, from the leading Rabbis in Israel to all the truly credible field experts, are unanimous in their findings that all evidences contradict the entirety of the Bible. This unanimity and conclusion has remained unchanged from what I can tell for at least half a century. The Bible was pretty much tossed out by the academic world shortly after Darwin published his monkey business, so whatever “findings” to discredit the Scriptures after that were a sort of afterthought. It makes perfect sense that mainstream archaeologists (and Israeli Rabbis) would be unanimous in their rejection of Biblical historicity. Such is the nature of paradigms. Those whose findings are acceptable, are credible; those whose findings deviate, are not. Since all credible experts support the paradigm, the paradigm is therefore proven to be correct. No one else, therefore, is to be taken seriously. So, if I wanted published and accepted by my peers and wished to make a go of it in the field, then I would reinforce the paradigm. Otherwise, my career would be relegated to the fringes. A case for accuracy: at least 40 kings can be corroborated by archaeological finds, from ten nations (Egypt, Assyria, Babylon, etc.) whose names are mentioned not only in the Hebrew Masoretic text (the Old Testament), but are also found on monuments of their own time. Thus, we have a good bit with which to reference the Bible. We also have a basis for comparing the Bible to other literature. Of the 40 kings having an archaeological corroboration, every single name is transliterated in the Hebrew Masoretic text exactly as it appears on the archaeological artifact — syllable for syllable, consonant for consonant, every single name. Additionally, we find that the chronological order of these kings is precise. Every name in the Hebrew Masoretic text, some of which go back to the book of Genesis and before the time of Hammurabi, appears in its correct order, with the correct spelling, in the correct time, as attested by the archaeological artifacts and period literature. To put that in perspective, the librarian of Alexandria, perhaps the greatest scholar of his era (circa 200 BC), listed the names of 38 Egyptian kings. Of these, only three or four are recognizable when compared to their respective archaeological artifacts, though none are exact. This same scholar also made a list of the kings of Assyria. In only one case does the name clearly resemble the name on the artifact, and that name is not spelled correctly. The only way most of the names can be ascertained and then matched up with an artifact is by intrinsic evidence and cross-referencing with other regional literature. And then Ptolemy, who listed 18 kings — not one is spelled correctly, and most are spelled so badly that we wouldn’t make them out at all without intrinsic evidence and cross-referencing. We find this same pattern in every other piece of literature extant. The scribe of Assurbanipal misspelled his names. The Pseudo-Callisthenes, in their list of the companions of Alexander, whose every name is unrecognizable. Abulfeda, the author of the Arab ante-Islamic history, misspells his names. The same is true of the lists of Manetho, Herodotus, Diodorus Siculus, Africanus, Castor, and so on. The only historical literature of antiquity that has demonstrated accuracy with regard to archaeological verification is the Hebrew Masoretic text and the Majority Greek text of the New Testament. Nelson Glueck — a preeminent archaeologist in that region — remarked: “It may be stated categorically that no archaeological discovery has ever controverted a biblical reference.” [Rivers in the Desert; History of Neteg] Philadelphia: Jewish Publications Society of America, 1969. Before getting into the matter of the patriarchs, I thought it worth mentioning in preface. Digging into the world of the ancient Hebrews and the Old Testament text is a complicated matter, but I wanted to go ahead and put it in perspective, stating categorically that the Hebrew scribes were not flippant in what they handed down. I have no doubt they gave no less attention to what these kings said and did. That the Hebrew writers transliterated at least 40 names (that we know of) with such accuracy and conformity to philological principles is proof enough for me, at least, of their thorough scholarship and access to the original sources.